A decade ago, Nicola Nice was developing brand strategies for spirits such as Bacardi and Campari when she encountered a question she just couldn’t shake. Nice did just that, traveling the country to speak with women about their relationships with spirits, the brands they identified with, and what was missing from that experience—all research that led to last January’s debut of Pomp & Whimsy, a botanical gin liqueur created with women and their wants in mind. Here, we chat with Nice about the female palate, women’s roles in spirits history, and next steps for female leaders in the industry. Why is the spirits world so slow to catch up in recognising and celebrating the emancipated woman? There are many reasons that play into why women have been excluded in the history of spirits—some that date back to Victorian- and Prohibition-era times. Much of this led to a self-imposed ban from the Distilled Spirits Institute that, from 1958 until 1987, stated that in no instance would women hold a drink in an advertisement, and no illustrations of women [would be] used unless they were depicted as dignified, modest, and in good taste. It created a cultural view around women in the spirits realm that they were simply accessories to a man’s success. And yet, you’ve mentioned that women are some of the biggest consumers of spirits today? Yes, absolutely. They’re driving trends in cocktailing because of the way they host and entertain. They’ve written prolifically on the subject throughout history with books on etiquette and entertaining that contain recipes for ways to create tonics and liqueurs. 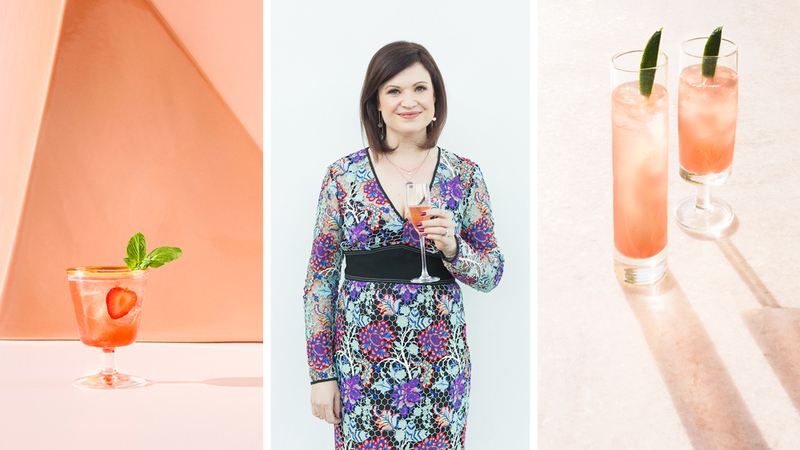 Today, it hasn’t changed: Women are writing plenty about how to host the perfect Super Bowl party or how to style your bar cart. You’d be remiss as an innovator not to be looking at women when you’re creating new products and brands. In your research, you discovered differences in how women and men taste certain flavours. We’re intrigued. The first thing that we know about women is that, on average, they can smell more than men. Ask anyone who’s been pregnant. In 2014, there was a study published that was looking at men’s and women’s brains post-mortem, and they found that women’s brains had 43 percent more cells and 50 percent more neurons in their olfactory sensors than male brains do. We know taste and smell are connected, so if we can differentiate more smells, perhaps we can differentiate more tastes, too. We know that 35 percent of women, as compared to 15 percent of men, are what scientists call “supertasters,” which means that they have a higher density of taste buds. It also means there are certain flavours that, to these people, are perceived much more intensely than they are to non-supertasters. Which may pose a problem for certain spirits. Right. If you’re a supertaster, the burn that comes with alcohol may be extremely intense to you, to the point where it could be unpalatable. When we talk about certain types of spirits that are traditionally associated with masculine values—big, bold reds; over-proof whiskies; super-smoky mezcals—men might be able to appreciate those flavours more because they’re not tasting them quite as much as we are. What it also means is that perhaps women have the capacity to differentiate much more finely between different types of flavours. How did these findings play a role in the creation of Pomp & Whimsy? We knew we needed to create something that would really stimulate the olfactory senses for women—something that was really aromatic. We also knew we had to ensure the flavours were really in balance and subtle, and that we weren’t just overloading her palate. This year’s creation of Jane Walker, Diageo’s attempt to target Johnnie Walker scotch to a female audience, led to significant backlash. What do you think went wrong? First of all, I applaud Diageo for trying to be more inclusive. But the insight that they’re putting forward is that women find whiskey intimidating and an old boys’ club, and that maybe if they just changed the label, it wouldn’t be the case. Unfortunately, that’s not getting to the heart of the issue, which should be about looking at women and understanding what whiskey means to them and what they’re looking for. It was also coming on the heels of the whole Lady Doritos discussion. The one thing women don’t want is to be talked down to. We want to be respected and taken seriously as drinkers. This wasn’t a success, but it’s a first step that I hope will lead to many more attempts. How is what you’re trying to accomplish with Pomp & Whimsy different? What else do we need to do to continue the momentum of female consumers being taken more seriously in the spirits realm? Like any other industry that’s been historically male-dominated, it would benefit from being more representative of women. If you look at any other category and line up the different brands that exist within them, you’ll see a spectrum—those that are hyper-masculine, hyper-feminine, gender-neutral. I think, from an innovation point of view, there’s room for the spirits world to mirror that. I’d like to have some competition that we can go shoulder-to-shoulder with on this. What do you hope to see in coming years with the creation of Pomp & Whimsy and other potential brands that come onto the scene? I want to see a community of women who are trying to create things with women in mind, and who are using the spirits world as a platform for having a place at the table. There is a big issue in the way the history of the cocktail is being written at the moment that does not include women’s stories at all, and I want to change it for the past, present, and future. I want to give back to women their rightful place in the history of the cocktail.